Underpinning Southfield Systems e~Commerce strategy is the powerful Southfields SSIPS Internet Platform, which allows TourCAT to be connected seamlessly and transparently to the Internet. Full suite of reports which provide a wide range of options including previous year and margin comparisons. 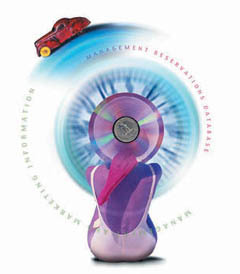 The accounts function has fully integrated TourCAT sales and purchase ledgers specifically developed for tour operators. TourCAT also has the facility to integrate its own or third party nominal ledger. The people behind TourCAT are just as critical to the success of your investment as the system itself. Southfield Systems is totally committed to customer support, from initial exploratory discussions right through every stage of the project. Our team of consultants, specialists in travel industry software, systems integration, internet and web applications will work closely with you to identity your company's I.T. requirements and the ways in which TourCAT can meet your operational needs, accommodate new distribution and product development and future business growth. Software support and comprehensive ongoing training have a vital role to play in ensuring you achieve maximum return from your investment. Support and training programmes can be tailored to meet your specific needs. Fully integrated with the reservations module, automatically authorises all credit card receipts on-line.